Although knowledge of dementia is on the rise, a recent study commissioned by Dementia Australia has shown that Australians ‘don’t know how to talk to people with dementia’, leading to social isolation and loneliness for many people living with the disease. Dementia Australia’s Dementia Friends program aims to transform the way our nation thinks, acts and talks about dementia. A Dementia Friend is someone who wants to make a positive difference to the lives of people living with dementia through increased awareness and support. Dennis Frost, Dementia Advocate and passionate Dementia Friends supporter, believes community connections are vital to combat loneliness. “People who live with dementia often face social isolation as friends, family and community struggle to understand how best to support and continue to include people living with the disease. “My own experience of living with dementia has shown me first-hand how people misunderstand the condition, but small actions can make a big difference. According to Dementia Australia CEO Maree McCabe, the need for Dementia Friends is more important than ever, with more than 436,000 Australians living with dementia across Australia. “We know people living with dementia regularly feel excluded from community and regular activities once they have a diagnosis, leading to profound social isolation not just for the person living with dementia but also primary carers,” Ms McCabe said. This Neighbour Day join the more than 15,000 Australians who have already signed up to become a Dementia Friend and help us change the way our nation thinks, acts and talks about dementia. 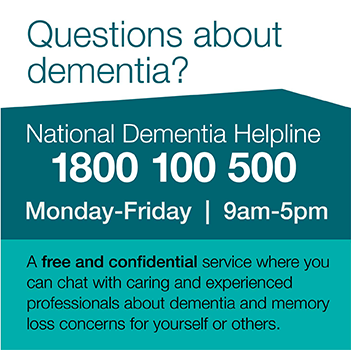 Media contacts: Peta Leveritt-Baker, peta.leveritt-baker@dementia.org.au, 0435 532 214.